Highway Kings is a five-reel nine-line slot devoted to modern heavy-duty trucks. You will come across the icons of trucks, auto accessories and other automobile imagery. 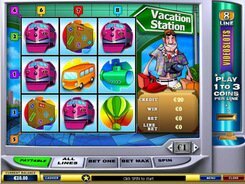 On loading up the slot, place a bet with its starting value of $0.01 and maximum point of $45 per spin. Minimal bets are fairly low, yet you can win 10,000 coins for a combination of five red trucks (wild symbols). The red truck symbol can replace other icons helping create winning combinations with a x2 multiplier. 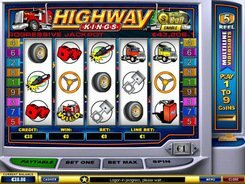 Highway Kings slot machine has no free spins, bonus rounds and the gamble feature. Yet this is an enjoyable well-rounded slot with fine graphics and good sound effects. With a great payout percentage of 97.06%, the slot will appeal to truck lovers, non-truck lovers and progressive jackpot seekers due to the Dollar Ball feature. PLAY FOR REAL MONEY!